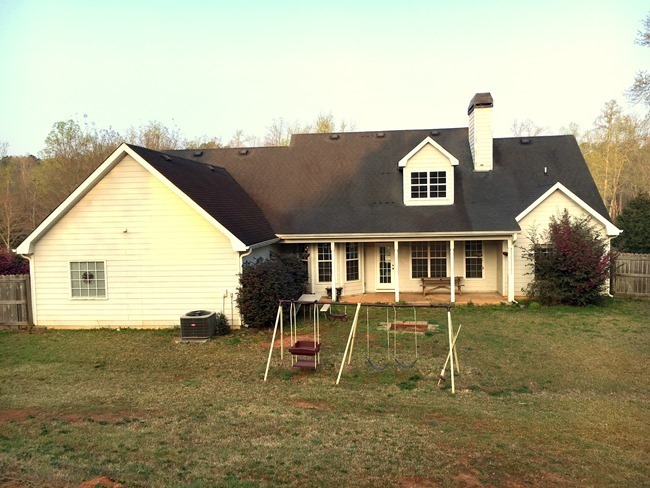 I am so excited to share the before pictures of our NEW house today on the blog! I am slowly transitioning back into blogging, trying to find a new schedule, recovering from and enjoying our new baby, and still trying to tackle a ton of projects that need to tackled around the house. I seriously have probably 10-15 posts worth of projects or before/afters so I hope to slowly work on taking/editing pictures and writing those up to share with you. 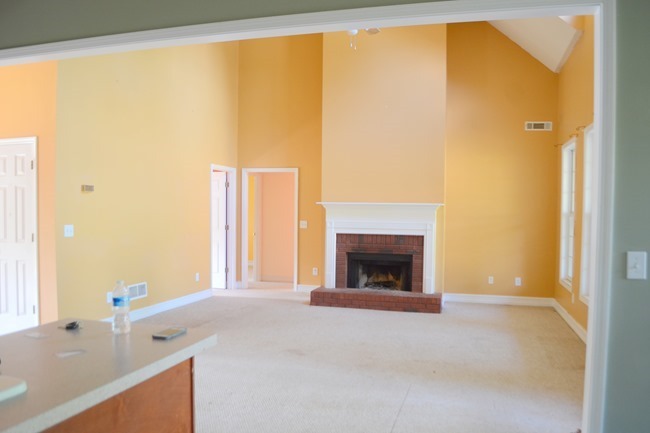 Lots of before/afters of our old house, what we have accomplished and plan to accomplish at this house and lots of smaller DIY furniture painting and home improvement projects along the way too. We sold our old home and bought/moved into our new home in May (just 3 weeks before the baby was due!) It was a CRAZY process of packing/moving at 8-9 months pregnant with lots of house complications along the way. I am so thankful I had a healthy pregnancy and felt really good too so that allowed me to accomplish it all. And that nesting phase in those last few week came in especially handy as I frantically unpacked and settled every room I could before baby got here. So here is our new home! Some of these will be pictures I took and some of them are listing pictures. I tried to take lots of pictures because these are definitely BEFORE pictures and can’t wait to look back and compare them once we can do the things we want to do to the house. I had been referring to our house as a ranch style house but someone told me that they think it is a modified Cape Cod style. The exterior style wasn’t exactly what sold on us on the house as we both like more Craftsman style homes but we think we can make some changes to improve the house and make it more our style in the future. 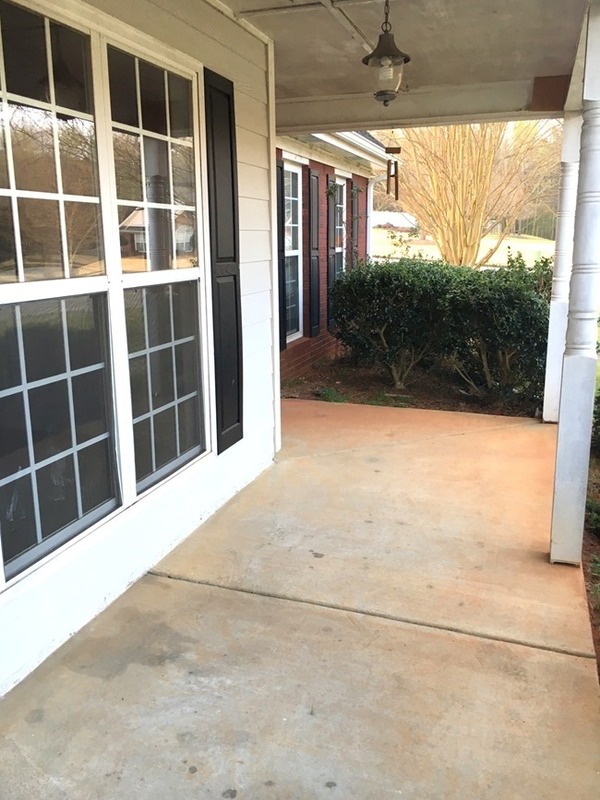 The front porch is long with space like this on both sides! 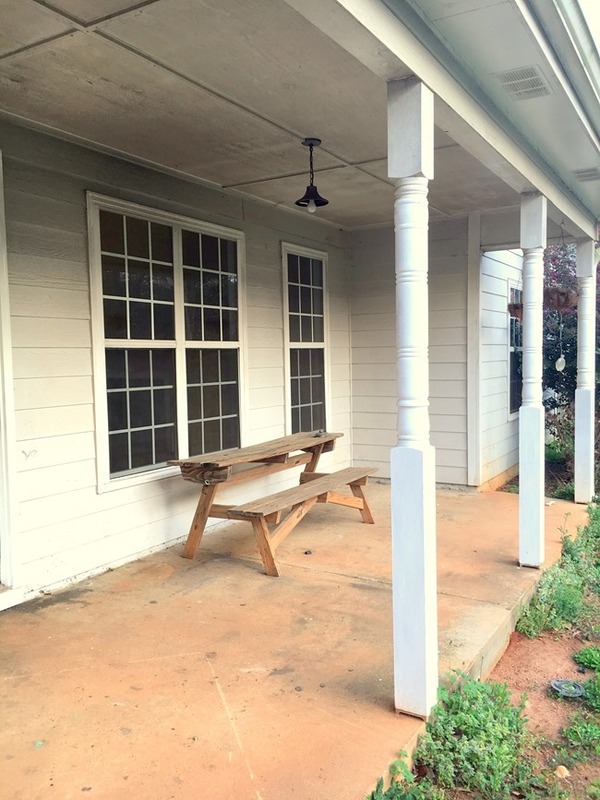 Already imagining rocking chairs and maybe a porch swing out here! Loved the covered front porch for sure. When you come in the front door there is a dining room to your right. 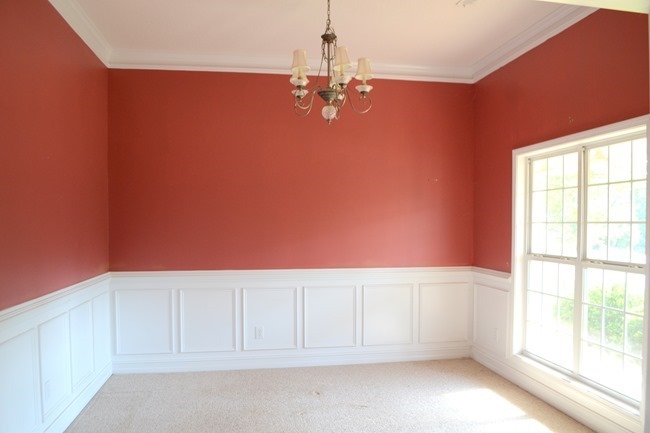 Love the molding that is already on the walls! We probably won’t use this as a dining room but you’ll have to wait and see how it turns out. And to the left is french doors leading to what will become MY office! And a massive closet to store all my crafting, decorating, event decorating type stuff. Can’t wait to get to work in here. 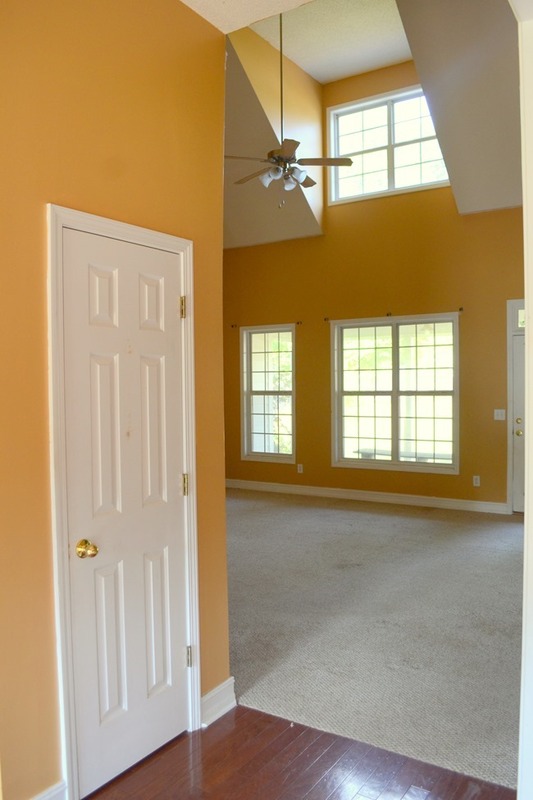 Another thing that we loved about the house was the high ceilings and open floor plan. This is leading into the living room. And here’s the fireplace wall! The only bad thing about ceilings this high is having to hire out to get them painted but otherwise I love them. Then standing in the living room look back at the kitchen. 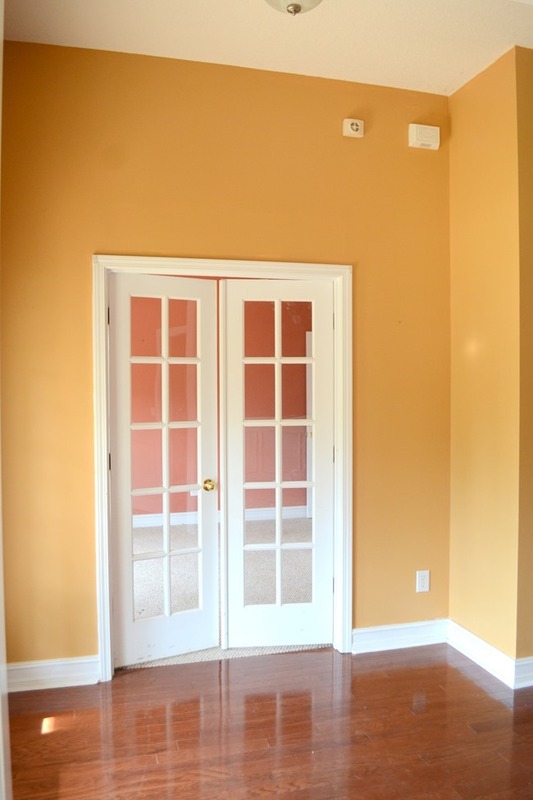 Joanna Gaines would be proud of that open doorframe! 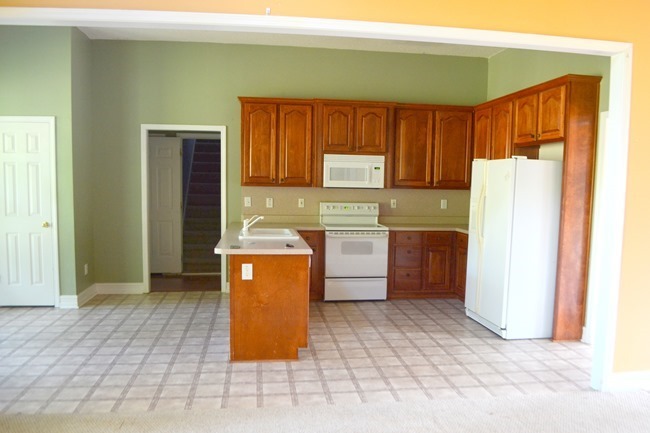 Fairly large kitchen (although I am finding it has less cabinet and counter space than my other kitchen had). We aren’t sure what our plans are in here yet – definitely new flooring, new countertops and may try to just stain the cabinets darker but we will see. Standing in kitchen looking back into living room. Arranging furniture in here has been different and a bit harder but a larger living room was on our wish list and we are sure loving this one. 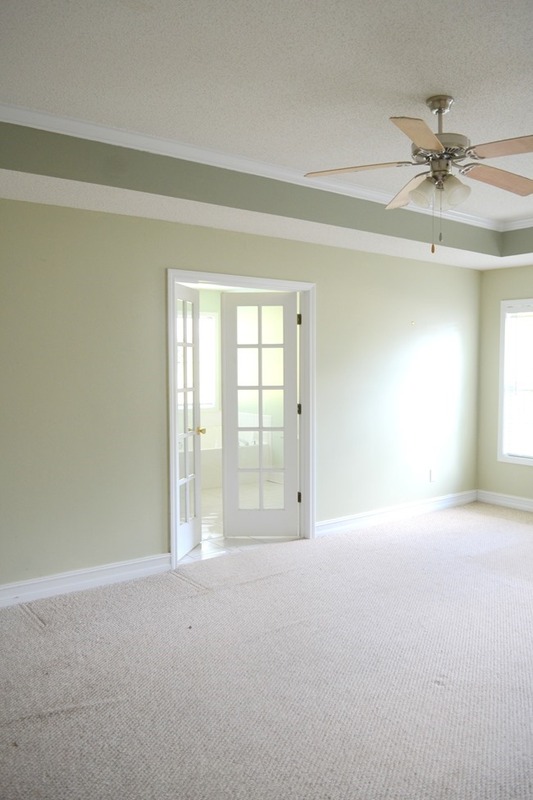 Master bedroom… with another set of french doors leading to the bathroom and closet. This will eventually be our guest room plus my nephews room when he stays with us. 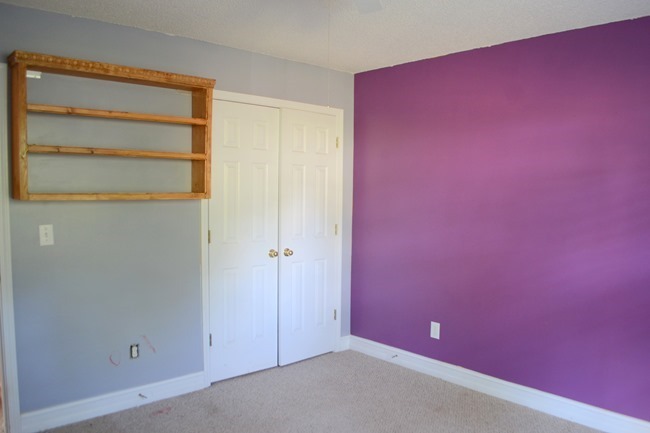 His first request was to please paint that Barney purple wall blue so it has been repainted although not blue right now. 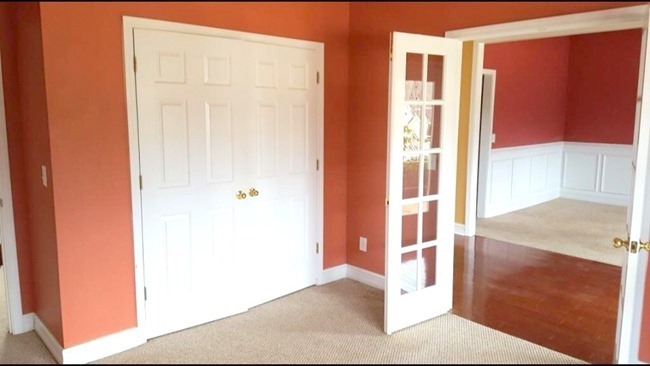 I really loved the large closets and double doors in the bedrooms too. 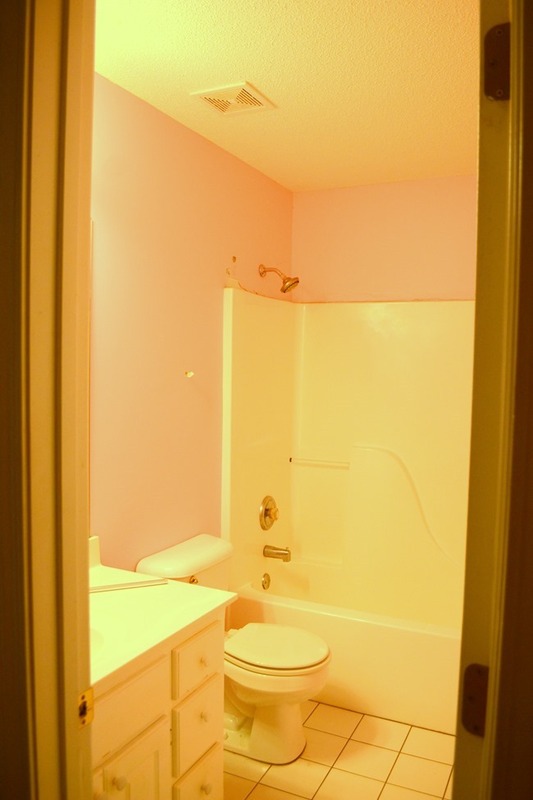 Hall bathroom with some rather bright pink walls. 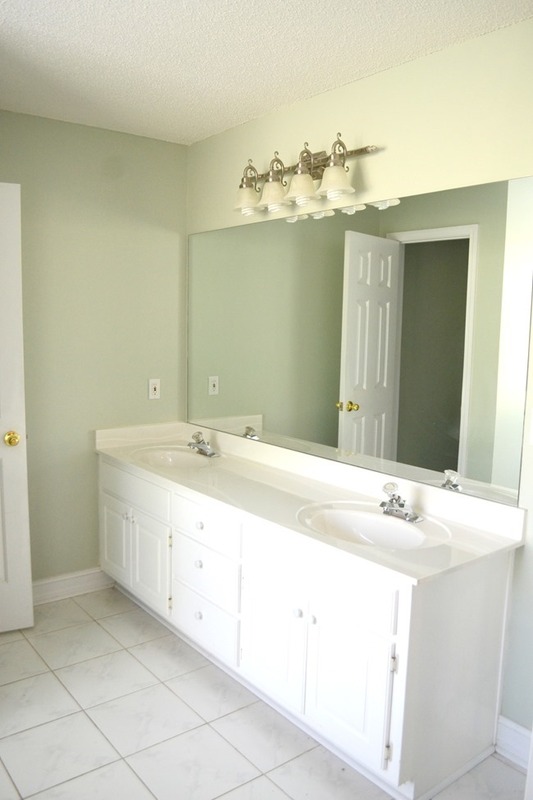 I already knew exactly what I wanted this bathroom to look like the moment I saw it and can’t wait to get it finished. 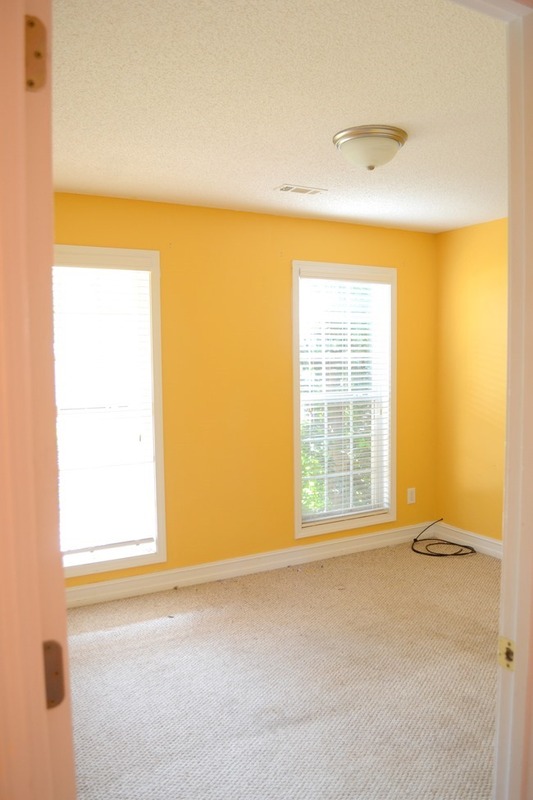 And this yellow room will be the nursery for our sweet little girl! I have done a lot of work in here but it needs finishing touches and decor so that is in process and hopefully will be done soon. Can’t wait to show you! 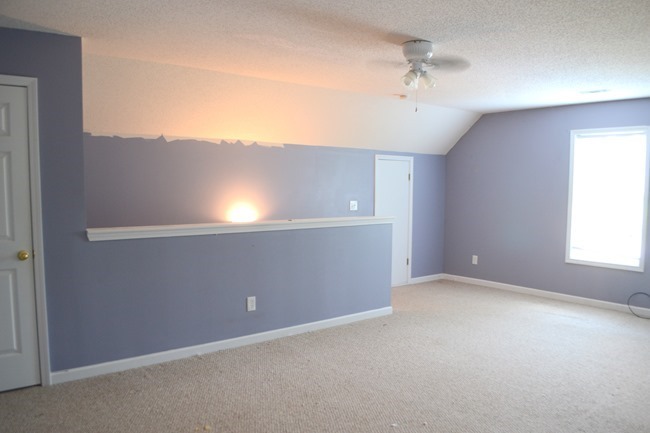 And the bonus room over the garage. This will be a library/playroom/room where my nieces sleep when they stay with us. I just love an attic style girls room and I think this will be such a fun room as I get to work on it. Another one of the features I loved about this house was the attic storage – that door in the wall goes to huge attic space with windows in it! We have to lay floor boards but can’t wait to get all the seasonal decor and extra storage things organized in here. We only had pull down stairs in our last house and having a walk in attic space is amazing! 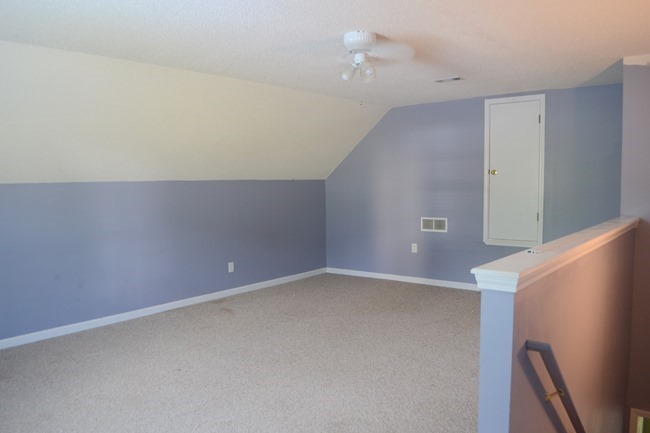 Here’s the other side of the bonus room with another smaller attic space – I am organizing and storing all my out of season and yet to grow into clothes for our little girl in here in bins and just loving the organization. And here’s a peak into the backyard. Another smaller covered porch which we love! Being able to grill in the rain and have a covered back porch has been great. Lots of plans on sprucing up this space eventually too. View of the backyard and back of the house. The acreage at this house is not too much larger than our last one but the difference is this yard is all open and grass where our last house had a lot of wooded area. So keeping up the yard this summer and getting back into shape has been a CHORE for sure. I usually help with a lot of the yard work because I really enjoy it (much more than my husband) but with my pregnancy and now a new baby it has been all on him. I have slowly been able to start doing some things and hope to work on putting in some new landscaping and beds soon. 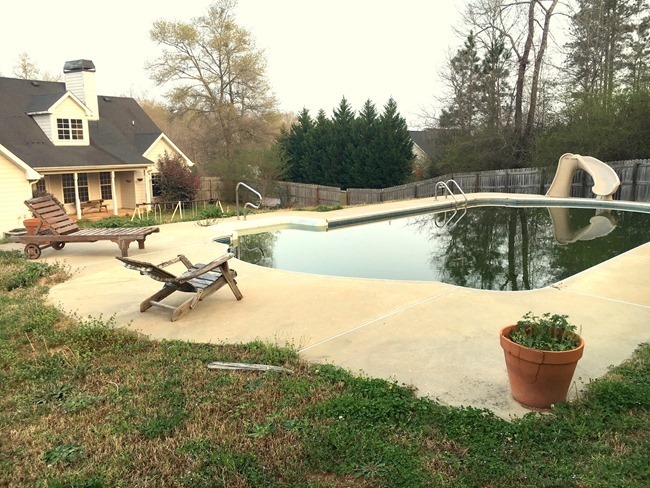 And if I step back a little further you can see another fun part of this house – a POOL! We did not have this on our wishlist at all and were actually surprised at the number of houses that we looked at that had pools. Our nieces and nephews have loved it and I am sure our little girl will too next summer. It sure has been a fun addition to our outdoor activities especially in the Georgia summer heat. Lots of plans to spruce up this area too in the future. So there’s the house tour! As you can see we definitely have some work to do – painting, updating, lots of yard work, and more – but we are so excited to gradually make this house into our home. I can’t wait to share the whole process and what we have accomplished so far with you. What was your favorite part? 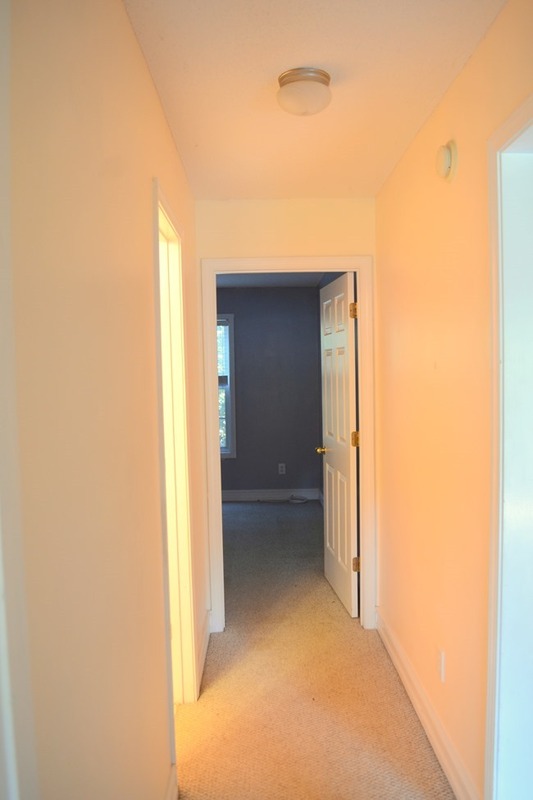 I would love to hear too what you would do with some of the rooms – paint, molding, decor? Any ideas for the yard and landscaping? Such a beautiful home and i love the layout. I cannot wait to move down South. 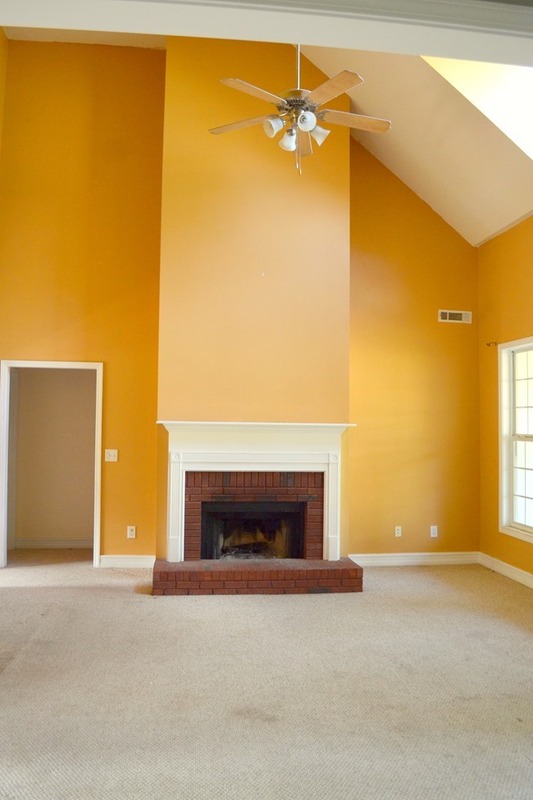 I really like the living room, and the walk in attic. I also live in Georgia, and having a swimming pool is a great bonus! Lots of fun projects ahead! Beautiful home. The new house is beautiful! Congratulations on it! Can’t wait to see what you’re doing/going to do to make it all your own. Personally, I’d want to rip up the carpet and put down hardwoods in hallways and general common rooms and new carpet in bedrooms. But that’s my personal style. Good luck with the improvements. Congrads! I can relate on so many levels! We just bought a new house too and have put my blogging on hold for a little while. You’re very brave for sharing the before pictures. It gave me some courage! Can’t wait to see the transformatoin! I’m going to love watching you frugally transform this diamond-in-the-rough. Thanks for sharing. Oh, and next time throw in a picture of the baby. Loved seeing these photos and will be fun to see what you do with it. Is this your first baby? If so, PLEASE don’t try to do everything you did before you had her! I did that with my first child and drove myself crazy… and neglected him in the process. I now regret so much that I didn’t spend more time just holding him, crooning to him, rocking him to sleep and enjoying his “baby-ness”. They become toddlers all too fast and then they’re off to kindergarten! Please make enjoying her and holding her, fussing with her, etc. your top priority. The house can wait (for the most part). Loved the house tour – there are so many great things! I loved the front and back porches, the great or living room with the fireplace, the open layout and all of the natural light! 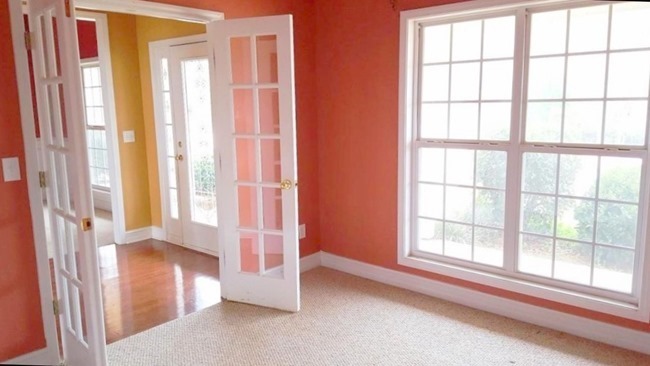 The previous owners definitely liked color didn’t they!?!?! Wow! 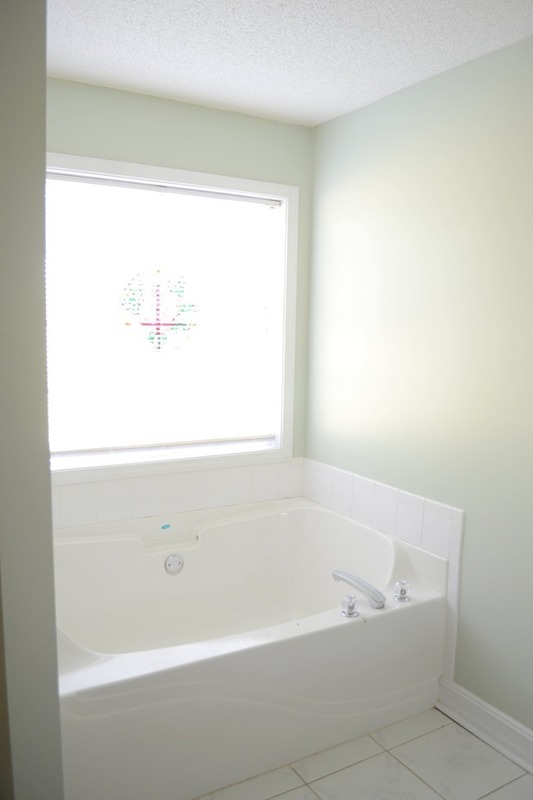 I can’t wait to see how you transform all of the different spaces with your personal touch! Thanks for sharing your home! Blessings to you and the new baby! Love the new place!! So much potential. I cannot wait to see what you do with it =) Congrats!! Congratulations on the birth of your daughter and your new home. The house has so many great qualities. I’m sure that in time you will make it your own. Best wishes to you and your family! I love this style of house. Wow–it sure is colorful. I am sure there will be much painting in the future and am looking forward to seeing it. The announcement card of your daughter is so precious. Thankful she is here and you were able to move before she was born. What a beautiful house and yard! I am sure with your talent and some time you will have if up to your standards in no time. That pool area is the best, how fun for family and friends to cool off in!!!! Enjoy your new home and baby!!! Looking forward to seeing more before and after post in the future. Great house! Looking forward to seeing all the updates you make to it. Love your new house and can’t wait to see all your ideas in the future!! Congratulations on your baby, and the lovely and large new home! One landscaping recommendation: Add a gated fence around the pool for safety. Nice. Looks like a very spacious house and yard.. Your home has so much potential! I’m sure it will be lots of fun. One thing that worried me, though, was no fence around the pool for when your little girl starts toddling–which will come much sooner than you think! Congratulations on your daughter–they are indeed a blessing from the Lord. Enjoy! Oh my goodness! This house is beautiful! I absolutely love all of the bright colors! Congratulations!